Technology has always played a very important role in my life. 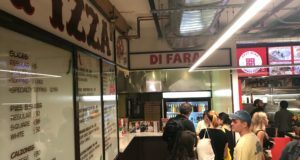 In fact, I Dream Of Pizza would not exist today had it not been for digital innovations that took place in the early 2000s — the proliferation of blogging platforms, social media, smartphones, etc. 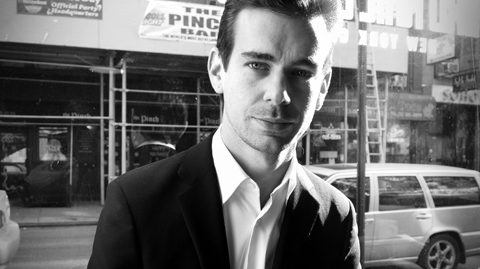 I believe that one of technology’s most important visionaries is Jack Dorsey (known to many simply as @jack). 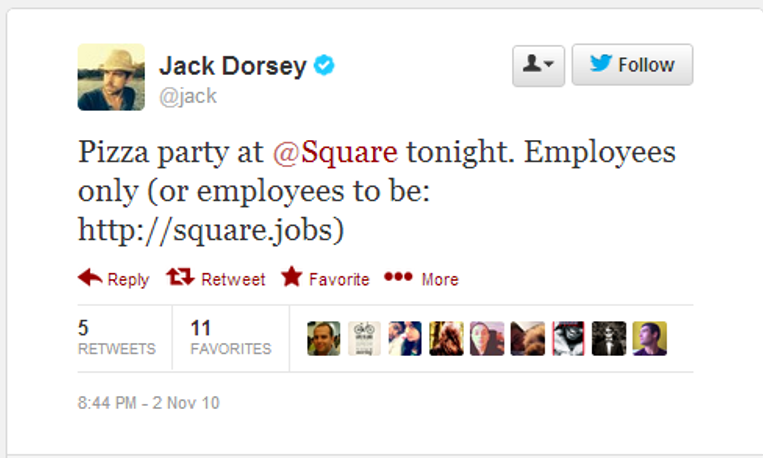 Dorsey founded not one, but two companies that are each worth billions of dollars and will likely IPO in the coming years. 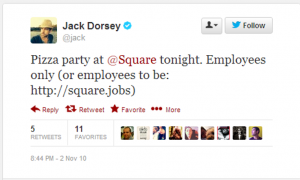 Twitter launched in 2006 and Square, a mobile payments company, followed three years later. I believe that one of Dorsey’s greatest assets is his ability to understand the user experience and oversee the creation of simple, intuitive products and platforms. His success has been well documented in hundreds of interviews he has granted in recent years, perhaps none more notable than a segment on 60 Minutes which ran this past spring. 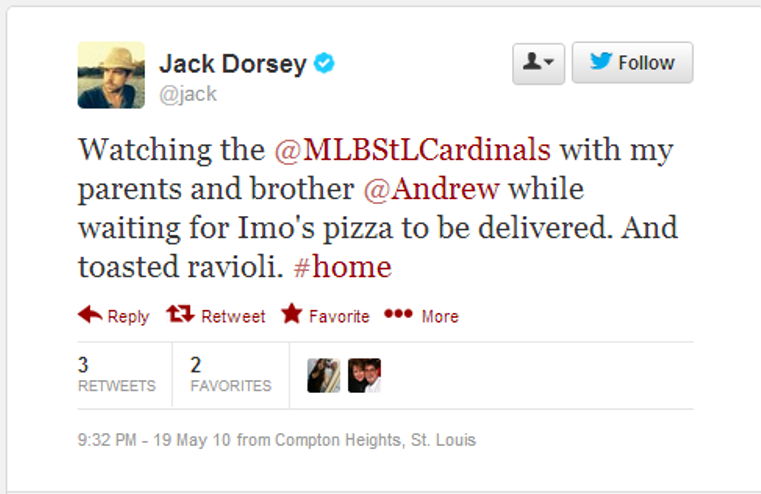 But what I only found out recently was the role that pizza has played in Dorsey’s life. During a recent keynote at Columbia University, Dorsey speaks about the influence that his parents had on him. His father, when he was 19 years old, decided he wanted to start a pizza restaurant because he loved making pizza. Along with his best friend Ron, they opened a place and it started doing well. 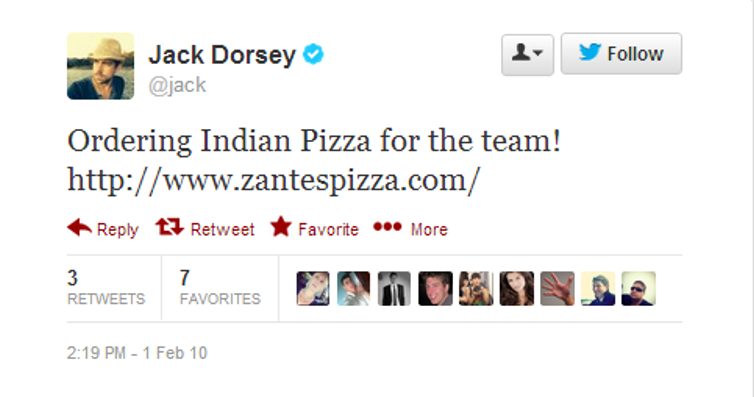 “My father’s pizza was an all meat pizza,” explains Dorsey, only half jokingly. “I don’t think it had cheese or sauce on it.” The company started doing so well, they needed to hire people and they made a rule that they would not date the waitstaff. The first person who they hired, as it turns out, ended up becoming Dorsey’s mother. His father left the business soon after, but Dorsey explains in his keynote that this story — and his father’s entrepreneurial endeavors — had a strong influence on him. Dorsey has racked up more than 14,000 tweets since Twitter launched 7 1/2 years ago (that’s a modest five tweets per day, if you’re counting). 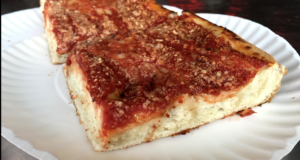 And a frequent topic over the years has been his passion for pizza, something that certainly was inherited from his father. 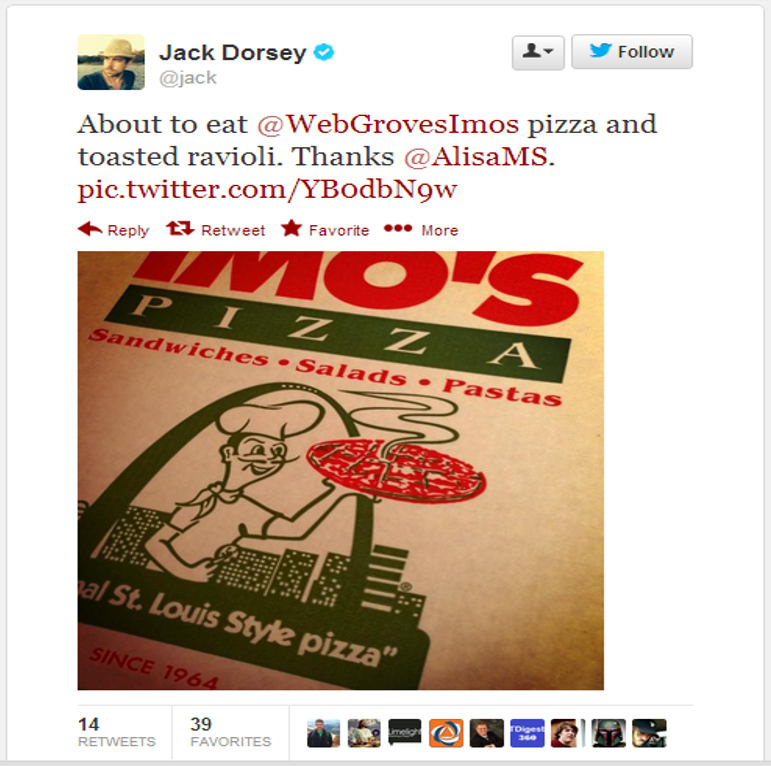 Dorsey’s first ever pizza-related tweet went out to the world on April 8, 2006 — just two weeks after Twitter launched. 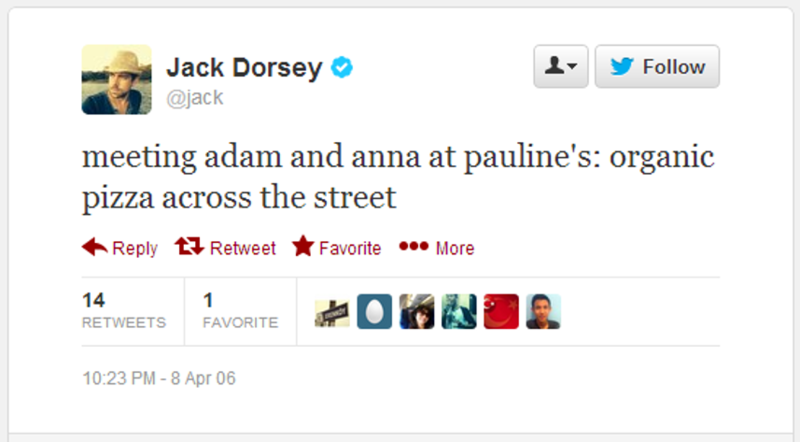 To give you a sense of how early on this was in Twitter’s existence — the post got 14 retweets and 1 favorite. Pauline’s, by the way, is a staple in San Francisco’s Mission District. 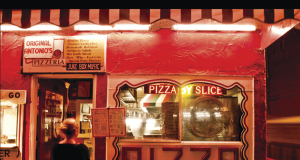 I ate there last summer while living in San Francisco and it was great. 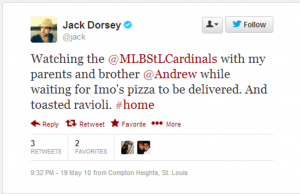 Dorsey grew up in St. Louis, Missouri, so it only makes sense that he’s tweeted about Imo’s more than any other spot. It was first mentioned in December 2012, accompanied with a TwitPic. 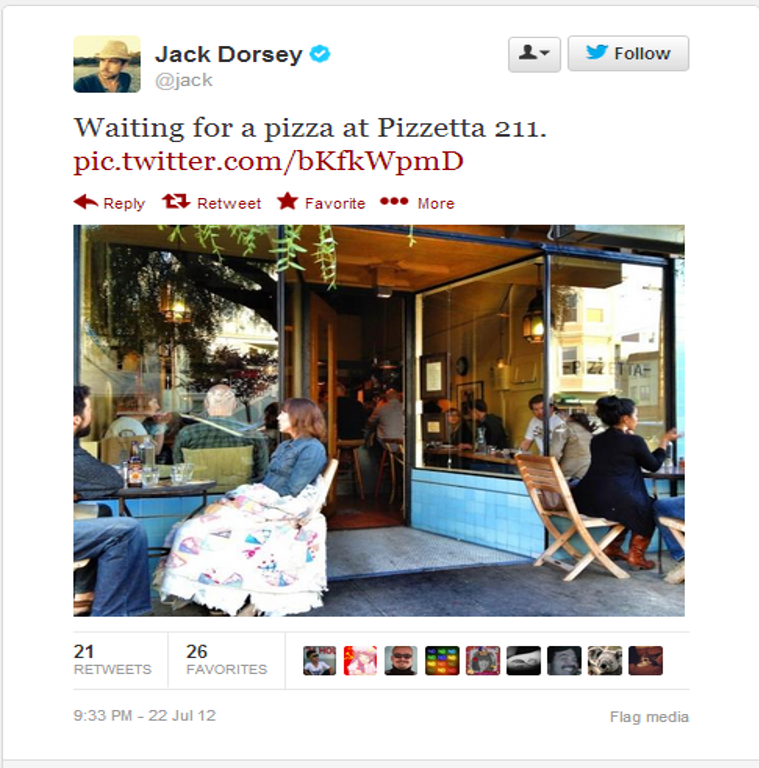 He’s presumably eaten there multiple times including in July 2012, when he tweeted this photo of the spot. Domino’s Pizza recently launched a new commercial which seems to catch my eye whenever it is on television. The motto: Powered By Pizza. The commercial starts out as follows: we know that Americans order pizza when they’re building, creating and innovating. And although I imagine (and hope!) 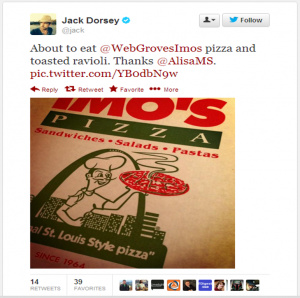 Domino’s is off limits in the Twitter and Square offices, I can only begin to imagine how much Dorsey has accomplished over a slice of pizza. Some my favorite Dorsey tweets about pizza involve what is being ordered at the office. 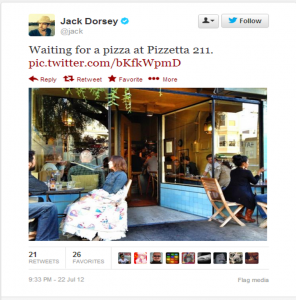 Although much of Dorsey’s love affair with pizza can be pieced together via a quick search through his Twitter history, as I’ve done above, I would love to chat with Dorsey in more detail about the role that pizza has played in his life and why pizza lends itself to fostering innovation. 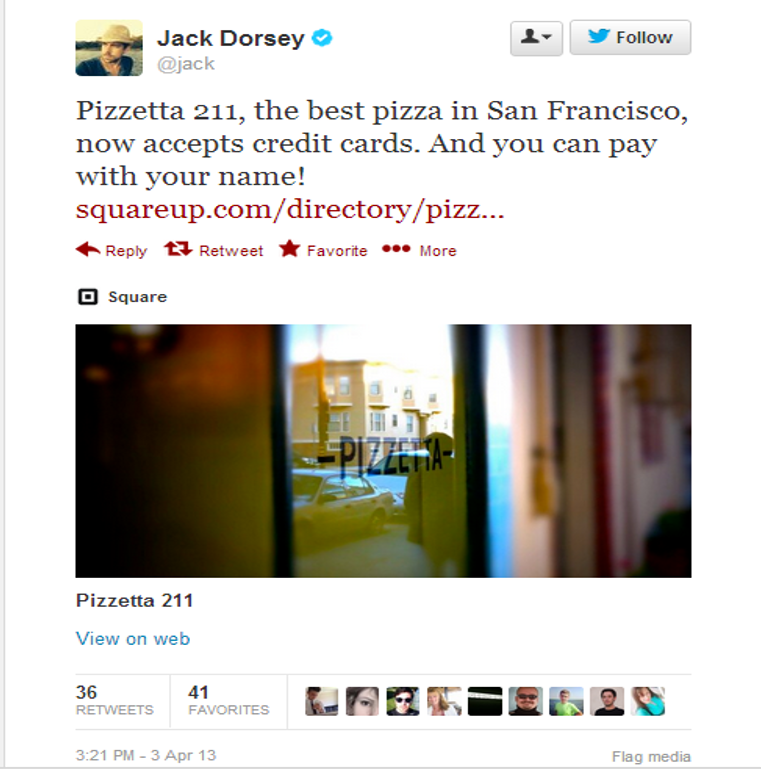 So @jack, if you happen to read this, let’s grab a slice!